Mrs. Harriman Mrs. Edward Henry Harriman, nee Mary Williamson Averell, founder of the Eugenics Record Office and inspirer of its initial work, died on November 8, 1932. She was born at Rochester, N.Y. July 22, 1851 the daughter of W. J. Averell. Of her management of the huge estate that fell into her keeping on the death of her husband it is not for us to speak here. She was devoted in the administration of her trusteeship and saw to it that what she regarded as the family fortune was not to be dissipated by lavish gifts and the establishment of foundations. She continued to support those philanthropies in which Mr. Harriman had been interested, she did much to promote safety in railroading, she gave 10,000 acres of land to the State of New York to create the Harriman Park, endowed a chair of forestry at Yale and gave to the Carnegie Institution of Washington the plant and farm of the Eugenics Record Office, together with a "dot" of $300,000 in cash. 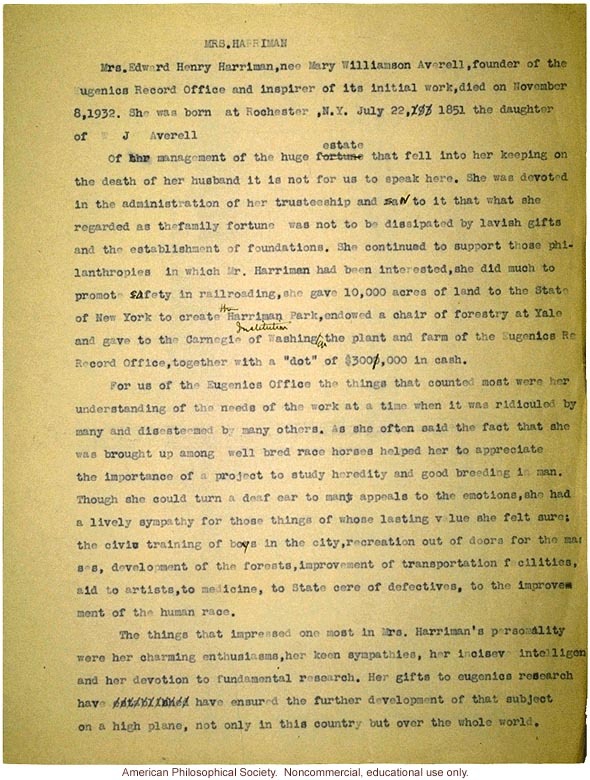 For us of the Eugenics Office the things that counted most were her understanding of the needs of the work at a time when it was ridiculed by many and disesteemed by many others. As she often said the fact that she was brought up among well bred race horses helped her to appreciate the importance of a project to study heredity and good breeding in man. Though she could turn a deaf ear to many appeals to the emotions, she had a lively sympathy for those things of whose lasting value she felt sure; the civic training of boys in the city, recreation out of doors for the masses, development of forests, improvement of transportation facilities, aid to artists, to medicine, to State care of defectives, to the improvement of the human race. The things that impressed one most in Mrs. Harriman's personality were her charming enthusiasm, her keen sympathies, her incisev[sic] intelligence and her devotion to fundamental research. Her gifts to eugenics research have [obscured] have ensured the further development of that subject on a high plane, not only in this society but over the whole world.